I'm an ex-admin of hitclickflow.com - why ex? As I closed this site today. I ran out of cash, as simple is that. But it's not your cash only I ran out of. difference I covered from my own pocket. So I ended up with 15000 USD debit on my account that I have to pay off now. that will end up with troubles. is closed now - my big apologies for that. and it will end up the same way I did at some stage. but admin will never get anything out of that, unless they invest something. I'm sorry for all those which lost money on my site and congrats for those which made huge ROI's. we want again hitclikflow.com will be start. I can understand you well, so much time and money invested and then empty. 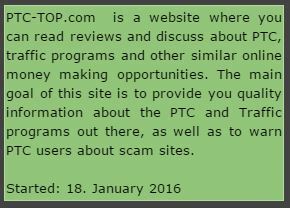 I doubt gradually at PTC, even if you upgraded, that you can make money here really. So I test now as you see also Hyips, is also a lottery game, but with significantly less effort! We've decided to make some changes on the site. We are introducing ROI (Return of Investment) factor. Why this is done? Almost all members of our site (upgraded, standard), which are renting referrals are getting great results here, and we are very happy with that. But we need to protect all the members, not only those which are investing so we have to make equal chances for everyone to get profit from our site. can withdraw as much as they would like, but their earnings are the slowest. % also depends on their membership. 4. Users witch deposits and rented referrals - their ROI is counted with this formula: ROI = (Earnings from Rented Referrals x 100%) / Total Deposits (without purchases done by funding account from account balance to purchase balance, only external payment processors counts). We set ROI for 200% for Standard Members, 400% for Premium Members and 600% for Ultimate Members. - Invest some money on the site which can be used for purchases on the site. - Buy Revenue Shares as income from them doesn't increase your ROI. - Upgrade your account to get higher ROI limit. Yes, we've decided to bring RevShares back as we got many requests to do so. This is also enabled for people to be able to decrease their ROI. We've reviewed their terms and decided to lower their duration time, please check them out! As we have to follow new rules, all pending cashouts are cancelled and money is back on your accounts but you can request them just now, without any waiting time. Also I would like users to encourage them to share their success stories, in here and especially outside our site. There are some members with 800% ROI already and they don't spread a single good word about HitClickFlow.com - that makes me sad and disappointed. We give you great earning opportunity so please share it with others! Also forgot to mention: we've enabled payouts with PayPal! First of all I would like to apologise for confusion with PayPal recently. We have a new partner now and we are enabling PayPal here for good! The only difference now is that it operates in semi-manual mode. Let me explain that quickly. If you want to buy something (or top up your purchase balance), you choose Manual PayPal method, then you just follow the instruction on the screen and after you do the payment, click button saying "I have paid". After you do, your deposit/purchase will be credited to your account within 24 hours. PayPal withdrawals will be enabled in few days. From now on you can see your pending deposits (BTC and Manual PayPal) in your Purchase History. Also in the same place you can see how much, per day, you've been charged for AutoRenew and AutoPay. We've fixed a direct referral upgrade commission for Premium referrals as well. We are working on getting new offerwalls in here so you can expect some more of them really soon! - From now until 30th Jan, 10:00 of a server time we have 5% deposit promotion for all processors. It applies only for funding purchase balance! Now you can top up your Purchase Balance and buy Upgrade with PayPal in manual mode. Just click on the tab: Pay with PayPal and follow instructions. We are working to integrate semi-manual mode for PayPal which will be introduced in few days time. Also PayPal withdrawals will be enabled soon, this will be also announced. We've decided to bring back the Referral's Contest. For the next month there will be weekly contest, with the main prize of $40. Please keep in mind that all prizes will be credited to Purchase Balance so you can spend that money on upgrade, referrals, advertising. Also to make it even better, we've decided to enable referral's upgrade bonus and referral's purchase commission! 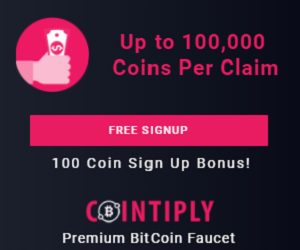 From now on you will earn if your referral upgrades his account, also if he makes purchase on the site (buying AdPackages for PTC Ads, AdGrid Ads or Login Ads). You can see more details on our updated FAQ page and on Upgrade Account page. I hope you will enjoy those changes! Those promotions are available until 26th of December. Those promotions are valid until Monday. I hope you enjoy them! We've enabled depositing money with BitCoin via CoinPayments wallet. Now it's possible to deposit BitCoin to your account straight with any BitCoin wallet you use. Just fund purchase balance, select CoinPayments button and you will get BitCoin address with the exact amount to send or QR code, easy to use with mobile applications. Keep in mind that depending on the amount it can take up to 10-15 minutes to credit your deposit on your account. Withdrawing with BitCoin is not possible and will be not enabled. If you deposit with BitCoin you can withdraw on any other payment processor available on the site.